The cathedral, which is the diocese’s main church in Pécs, was designed by Friedrich von Schmidt, an architect born in Frickhofen, Swabia, in 1825. Friedrich von Schmidt, who lived in Vienna from the mid-19th century onwards, was commissioned to restore the dome “according to its original style”. This meant a combination of romanic, gothic, baroque and neo-gothic elements. Schmidt modelled his plans for reconstruction – which actually meant building the church anew – on romanic basilicas of Lombardy with their pillars and panelled ceilings. The demolition work on the old medieval dome was started in 1882. On June 21st 1891, the new dome was consecrated in presence of Franz Josef I, Emperor of Austria and King of Hungary. The figural and ornamental paintings in the main and side naves were done by German and Austrian artists (Moritz von Beckerath, Karl Andräa, Gustav Bambeger). The side nave and the lower church were decorated by Bertalan Székely and Károly Lotz, who had both studied in Vienna and Munich. 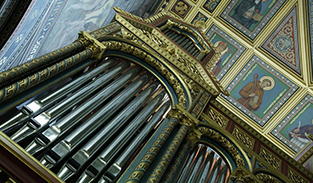 The organ was produced by a local company of József Angster. He had learned his trade in Austria, Germany and France and had founded his own organ manufactory in 1867. 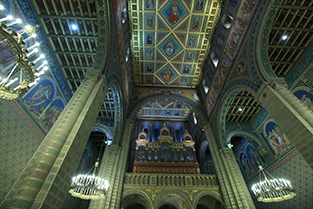 József Angster’s 100th organ can be found in the basilica. The cathedral’s richly ornamented columns and panelled ceilings.